This 2018 edition of the Barrett-Jackson Collector Car Auction was its 47th year in Scottsdale Arizona. In 1967 Tom Barrett and Russ Jackson held a special car show that also featured some of their antique, vintage and classic vehicles. The event went so well that they decided to hold an auction in December of 1971. The first auction, was basically to sell some of their personal collection of classic automobiles, including two Mercedes-Benz 770K Phaetons, that were part of Hitler’s staff cars. One of them sold for a world record, at the time, $153,000. That first auction sold some other high-end classic vehicles such as Duesenberg, Packard, Rolls Royce etc. That auction started the annual event that has always been in Scottsdale, where it continues today. Russ Jackson passed away in 1993 and Tom Barrett in 2004. Also in the 1990’s the auction had gotten so big, attracting nearly 100,000 people, that they needed to find a new location. The sprawling WestWorld Equestrian Center in North Scottsdale was that facility and where it continues to this day. Back then WestWorld consisted of a huge grassy polo field, a few horse arenas, a few barns and some smaller buildings and many acres of desert land. 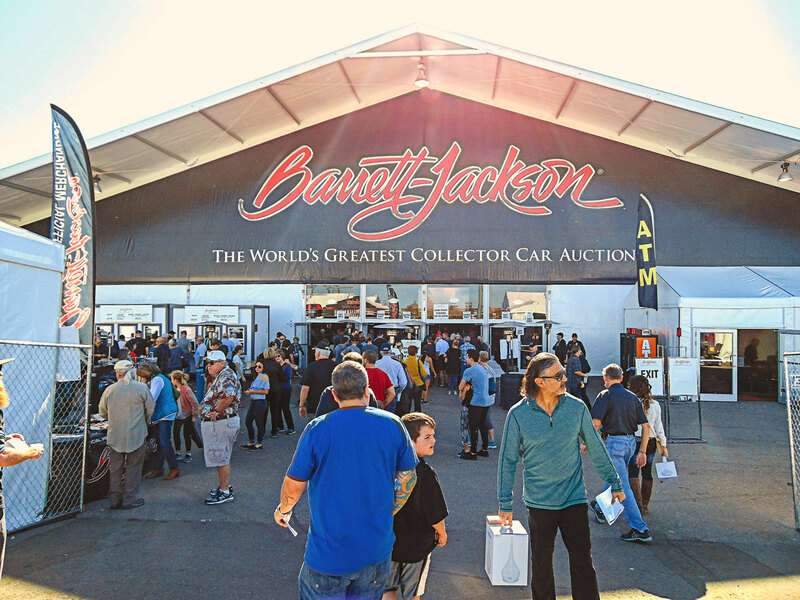 The Barrett-Jackson auction was held in a large tent. Today, WestWorld is a world class equestrian and special events facility with multiple barns and arenas. The auction tent has given way to a massive pre-fab building that can house over 5000 people in the auction stadium. 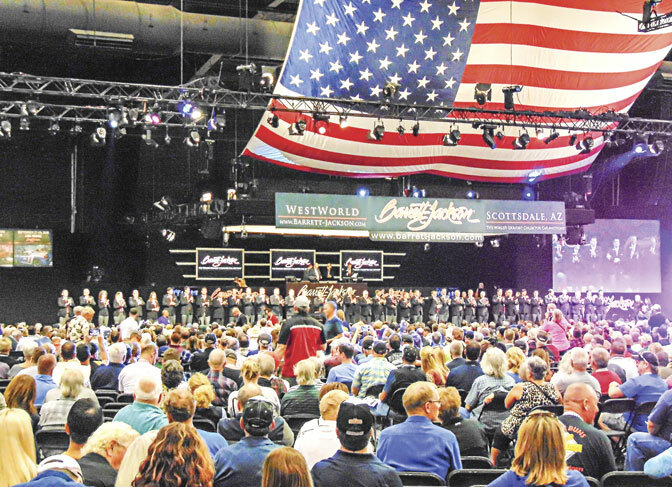 For the last several years, there have been over 4000 registered bidders, making Barrett-Jackson Scottsdale one of, if not the largest vehicle auctions in the world. The beautiful grassy polo field is still there and much of that desert land has been converted to well-groomed gravel parking areas for the hundreds of thousands of people that came to WestWorld every year. The Goodguys Rod & Custom Association now holds their opening (March) and season ending (November) events at WestWorld. In 1997 co-founder Russ Jackson’s son Craig Jackson who had worked in the company since the beginning, was promoted to President/CEO, and in 2004 Steve Davis was named President. Also in 1997 the Speed Channel TV network began airing live coverage of the Barrett-Jackson Scottsdale auction. With the TV coverage came more and more innovations, including adding other auction locations. When Speed TV ended, FOX TV took over coverage and in 2015 Discovery Network and Velocity TV have televised the Barrett-Jackson auctions with many hours of live auction coverage. The TV coverage has helped raise attendance in Scottsdale to close to 300,000 people, making it one of the two biggest events each year in Arizona, eclipsed only by the Waist Management Phoenix Open PGA Golf tournament, that’s held right after the auction, just a few miles down the freeway also in Scottsdale. Barrett-Jackson Collector Car Auctions are well known for their commitment to helping local and national charities. Just since 2006 they have raised over 94 million dollars for charity and the 2018 Scottsdale auction could increase that number to 100 million. If it doesn’t happen at Scottsdale, it will certainly be reached during 2018 with three other auctions on the schedule. Palm Beach FL. April 12-14, Mohegon Sun in Uncasville CT. June 21-23 and Mandelay Bay in Las Vegas September 27-29. www.barrett-jackson.com for more information.